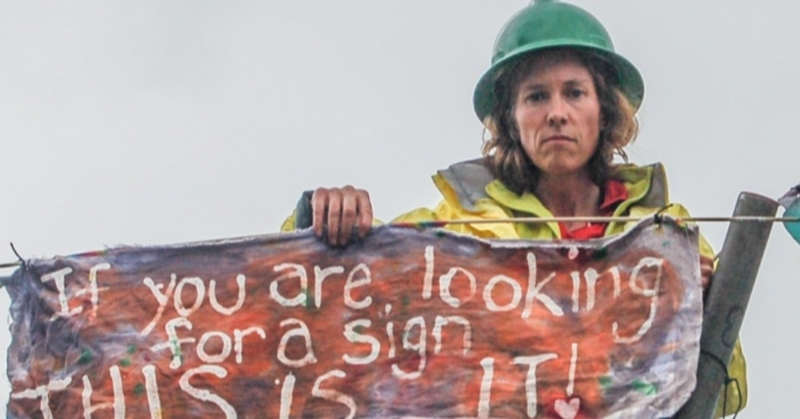 Today in Lynnwood, WA, five climate activists who blockaded an oil train in September 2014 were found “not guilty” of obstructing an oil train and “guilty” on a more minor trespass charge. The obstruction charge was the more serious charge and if found guilty the group would have been responsible for possible restitution from BNSF Railroad. #Delta5 judge fears more criminal acts. 2 years probation. 90 days in jail, 89 suspended.$1000 fine, 800 suspended + 125 in fees. Yesterday, the judge presiding over the case, Judge Anthony Howard, disallowed the idea that the defendants were acting out of what was necessary to save the planet from catastrophic climate change. After two days of expert testimony by researchers and scientists on the perils of climate change and the impact that non-violent direct action has on politicians, corporations and issues at large, the judge told the jury to disregard all that they’d heard. The disallowing of this strategy was seen as a blow to the Delta 5’s legal defense and the historic nature of a climate trial with the “necessity defense” as its cornerstone. Corporations and the government don’t want a climate movement willing to take such risks to stop such abhorrent destruction costing them untold profits. Meanwhile in New York, another begins with lawyers making the same argument in defense of the Montrose Nine after they blockaded a Spectra facility working on the Algonquin fracked gas pipeline in Montrose, NY. This entry was posted in Climate, Direct Action and tagged Algonquin pipeline, Big Oil, BNSF, climate change, Climate Trial, Delta 5, direct action, Montrose 9, necessity defense, Spectra, verdict. Bookmark the permalink.